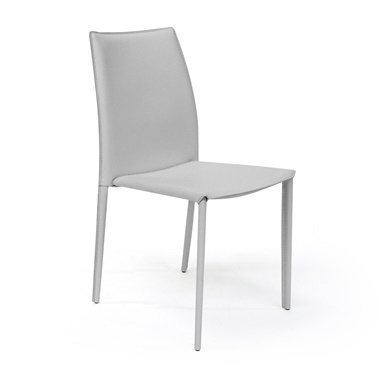 Nuevo's Sienna Dining Chair features a conservative design that falls harmoniously into any d�cor. This modern leather dining chair gets back to basics with a classic design while embracing today's contemporary style with a durable steel frame fully wrapped in smooth, regenerated leather. Light, CFS foam-injected seating provides just the right amount of cushioning while a tall, curved back ensures optimal support for its occupant. Whether used in the dining room, at the office, or as accent seating elsewhere in your home, the Sienna Dining Chair is a good fit for almost every d�cor thanks to a classic yet modern design and multiple color options. Always a bit unnerving to purchase items sight unseen, but accurate photos and descriptions as well as perfect attention to detail with the packaging led to six chairs delivered in perfect condition, as promised. They are beautifully crafted and comfortable. Do you send swatches of leather for the Sienna chair? I would like to see Bordeaux and Ochre in our space space before buying. Also, how which is the seat padding? The Sienna Dining Chair is not stackable. What is regenerated leather? Is that the bonded or split leather? Regenerated leather is leather that has a completely smooth surface and is produced when the leather goes through a process that compresses its fibers. This type of leather is sometimes used to upholster seats in restaurants or other commercial settings.